All starts quite slow on opener Reyn Til Runa, but it sets the atmosphere for you, as a listener, to be transported back to Viking times – at least you would think so, as the backbone of Fall Into Winter is definitely Viking metal, but also features quite a bit of black metal influences. And exactly this transition towards black metal continues on A Wolf’s Angle, and Alaskan Ice and Woden’s Revenge being basically black/death metal tracks. 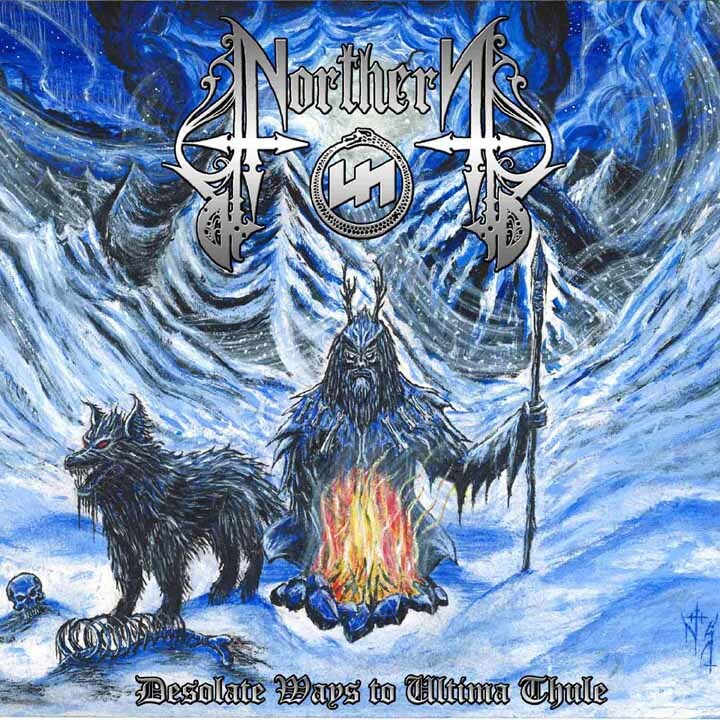 Thematically, NortherN state that Desolate Ways to Ultima Thule revolves around “…dark Paganism, serial killer stomping grounds, Gnostic demonology, death fascination, hillbilly substance abuse and other assorted devil worship.” The album also features a cover of Burzum’s Spell of Destruction. Live Free of Die is then again leaning more towards Viking metal, as I would have expected from the self-proclaimed North America’s #1 Viking metal band. Exaltation from the Grave is alike Alaskan Ice in sound, while the neofolk version of Fall into Winter is a very nice closing track for the album. In conclusion: I started listening to Desolate Ways to Ultima Thule with the expectation to hear Viking metal à la Amon Amarth, but honestly this album feels like a black metal one, with some Viking influences, to me. This is quite alright, but the one thing bothering me is the somewhat raw production. Being it deliberate or not, while this worked for me on other records in the past, here it diminishes the overall quality of the album in my opinion, which is a shame. Nevertheless, this is a solid album, so surely give it a spin if you come across it! 7.5/10.